Essentials of Athletic Injury Management provides the information you need to manage the care of athletic injuries — from prevention, identification and assessment of injuries to interaction with players, parents and physicians. 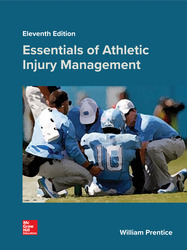 Designed for those beginning careers in coaching, physical education and the fitness profession, this text prepares students to manage injury and emergency situations when an athletic trainer or physician is not available. Action plans, checklists and applications of universal precautions in athletic environments are included to provide the practical tools needed to get started in the field.